Latest addition to the famous CroisiEurope fleet, due to be launched in 2018- Elbe Princesse II will allow you to explore the gems of European rivers on board one of the most advanced, economic and comfortable vessels in the world. Newest ship can only mean one thing- highest standard of cabins available on board. Due to relatively small passenger capacity (90), the ships cabins have been designed to offer highest possible comfort, attractive aesthetics and stunning views thanks to large windows. 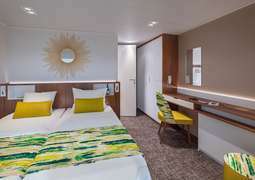 Bright and colourful staterooms feature a private bathroom, safe and free Wi-Fi available throughout the ship. Enjoy on board delicious meals, freshly prepared by experienced chefs and staff who deliver mouth-watering dishes while cruising along the most scenic landscapes in the region. Breakfast and lunch served as a buffet and specially prepared dinners with many options available to suit even the fussiest of passengers will guarantee a remarkable time spent on board Elbe Princesse II. Immerse yourself in the true definition of European river cruising. Visit a multitude of locations on the Old Continent, exploring the historical and cultural gems that the cities have on offer. Return to your remarkable, state of the art vessel to spend some relaxing time on the Sun deck or socialise with fellow passengers in one of the bars or restaurants on board. Near the end of your cruise, don't forget to visit the gift shop located near the reception to acquire some tokens for your relatives or simply for yourself to remember the amazing time spent with Elbe Princesse II. A casual apparel is generally accepted throughout the cruise on the Elbe Princesse II, however if you wish to attend special events like captains' reception or galas organised in restaurants a more formal apparel would be considered appropriate.